I'm sure you know him from "The Commish" or maybe "The Shield" or maybe those somewhat awful Fantastic Four movies. What you may not know, however, is that he's from Andover, MA. 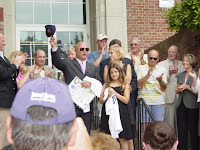 June 27th, 2008 was declared Michael Chiklis Day in Andover as the actor visited and recieved the key to the city. "You are entering rarefied air," Town Manager Reginald "Buzz" Stapczynski told the 44-year-old actor as he handed over the representative key to the town where Chiklis was raised. Only two other keys have been given out that Stapczynski could remember, one to a visiting principal from China last fall and the other 12 years ago when a group from Andover, England, came to visit. No other entertainers, including Andover native Jay Leno, have a key to the town. Congratulations to Mr. Chiklis. It's nice to have your accomplishments acknowledged by the community that you came from. Hopefully one day I'll do something awesome and Plano, TX will decide to give me a key to their city. Hehe. Click (here) for an article about the event in the Eagle Tribune. 0 Response to "Michael Chiklis Day in Andover - 6/27"